Having covered most of his back, arms and chest in tattoos, David Beckham has been concentrating on inking his hands lately, and the soccer icon has just revealed two new tattoos on his fingers – a number “7” tattoo on his left-hand pinky finger and what appears to be a rose design on the ring finger of the same hand. Photos of David Beckham’s new tattoos cropped up online after the model was spotted carrying daughter Harper around New York City, an unannounced trip the Beckham family took to surprise Victoria during her fashion week show. In the photos, David can be seen cradling Harper’s head with his newly inked-up hand. The first of David Beckham’s new tattoos is a simple number “7” inked in black on his left-hand pinky finger, a piece that is believed to be a tribute to Harper, whose middle name is Seven. 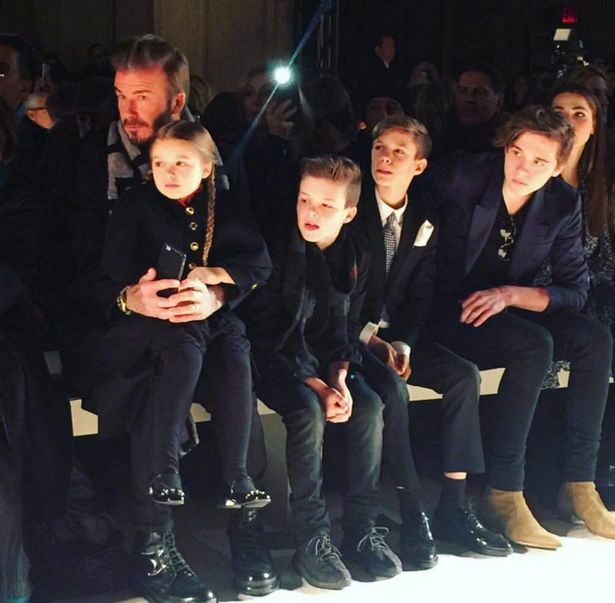 Of course, the Beckham’s chose Seven as Harper’s middle name to commemorate David’s jersey number when he played for Manchester United and England, so his number “7” tattoo actually plays double duty as a tribute to his daughter and illustrious soccer career. David’s new “7” tat is also very similar to the “99” tattoo he had inked on his other pinky finger in 2015, in honor of the year he both married Victoria and helped Manchester United to a European Treble, winning the FA Cup, Premier League and UEFA Champions League in a single season. David Beckham’s second new tattoo is harder to make out, but appears to be a small rose design, which conveniently sits just below the wedding band on his left-hand ring finger. 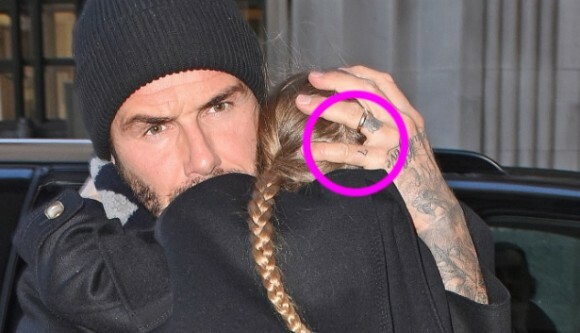 Because of its location below his wedding band, and because David Beckham is so fond of getting tattoos dedicated to his wife and their rock-solid marriage, we’re guessing that this new ring finger ink is another tribute to Victoria. Other David Beckham tattoos honoring Victoria include a “Victoria” and swallows tattoo on his hand, a “Victoria” Sanskrit tat on his arm, a ring of roses tattoo around his left arm, an “I am my beloved’s” Hebrew tat on his arm, and a Roman numerals tattoo on his wrist of the date David and Victoria took part in a secret commitment ceremony. There’s no word yet on when and where David Beckham got his finger tattoos, but the ink is definitely new, because the “7” and rose finger tattoos are absent from a recent photo shoot David did for his H&M bodywear line at the end of January. What do you think of David Beckham’s new tattoos?